I WAS STILL GETTING RE-ACCUSTOMED TO WALKING on solid ground as I took my first step into the refreshingly cool waters of the Waiea (“Water of Life”) stream running through the open-air gardens at the Hualālai Spa, the multitextured pebbles massaging my feet with each step. I spent the last hour scaling Four Seasons Resort Hualālai’s rock-climbing wall, dressed in yoga gear while dreaming of gravity as my private instructor guided me through a choreographed series of yoga poses and rockclimbing techniques. It is the resort’s latest fitness experience called Beyond Bouldering, aka Wall Climbing Yoga, and the sensory path through the lush gardens now acted as a grounding experience for me in more ways than one. I exchanged my spandex for reusable rubber slippers and an airy yukata robe as I began my journey through the ecofriendly spa, and I felt the cool air hit my skin as I made my way indoors to the Apothecary and the air slipped gently through the weave of the natural fibers. 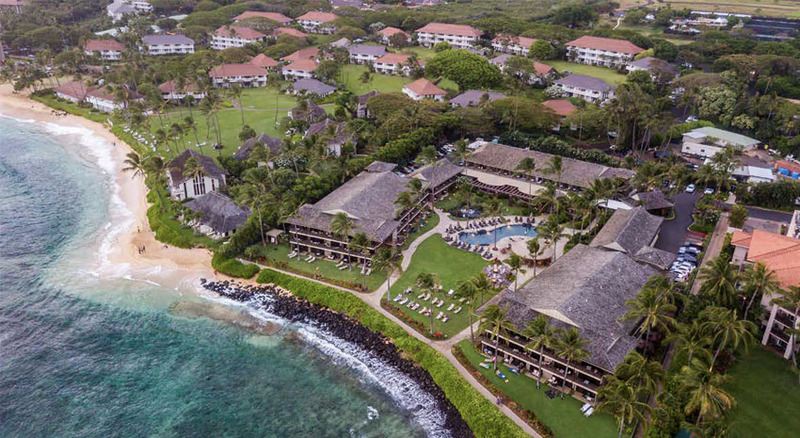 The Apothecary acts as Four Seasons Hualālai’s homage to the kupuna (Hawai’ian elders), trained in the old Hawai’ian ways of using local plants and materials to make medicines and treatments. 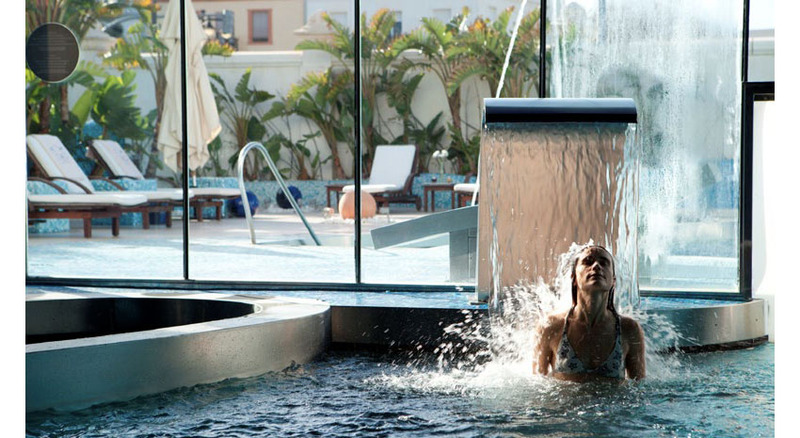 It serves as the central point for housing all the ingredients used in creating the spa’s signature body wraps and scrubs. I was greeted with an herbal tea and a warm smile as I approached the wooden apothecary table and met my spa concierge, who would help me choose from the more than 40 ingredients (20 are local and all are made from 100 percent natural plant and mineral resources) displayed in varying sizes and shapes of bell jars and containers. Guests are encouraged to customize their own mix of ingredients to complement their spa therapies (massages, scrubs, wraps), and the list features Hawai’ian ingredients like local pa’akai (salt) from the island of Molokai, organic turbinado sugar from Maui and spirulina from Kona. Other ingredients could just as easily be found on one of the menus at the resort’s three restaurants or two lounges, with jars of crushed macadamia nuts and lemon salts for exfoliation treatments; containers filled with organic coconut milk and local honey for adding hydration to jet-lagged skin; and even large glass jars filled with food-grade mud, clay and organic hibiscus buds that add local elements to the treatments. I chose the Hulali Apothecary Treatment (80 minutes), a body scrub fittingly named after the Hawai’ian word for “sparkle” due to the way the skin shines after this customized polishing treatment. I selected my native oils, herbs and flowers to create a heavenly scented scrub that consisted of no less than 11 different elements, and my therapist blended the ingredients together before my eyes before whisking me off to a private treatment room where I would begin my transformation toward iridescence. The Apothecary treatments account for only a portion of the spa’s eco-friendly offerings, including the Apothecary Mud & Clay Mosaic Treatment (80 minutes), where therapists use volcanic mud and deep-sea clay to create a wrap that tones and stimulates the skin. 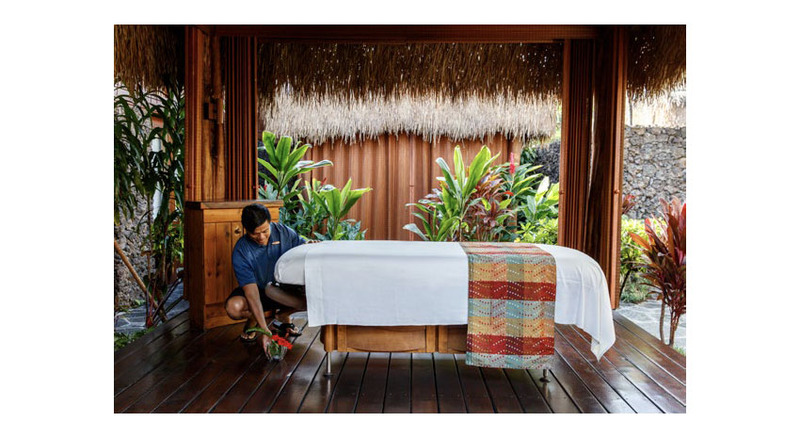 The Wawali Apothecary Treatment (80 minutes) uses indigenous ingredients to create a body mask and wrap that cocoons the body while the therapist performs a face, neck and scalp massage. The Linohau Apothecary Treatment (120 minutes) blends the Hulali scrub and the Wawali mask and wrap into one decadent experience. 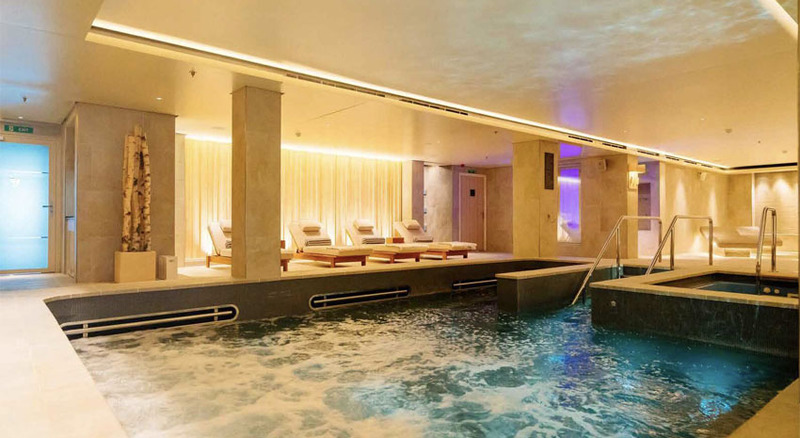 The spa itself encompasses 28,000 square feet in which beautifully curated eco-design elements (hand-selected by celebrated designers Babey Moulton Jue & Booth) guide guests into the realm of relaxation. All of the spa’s massages and body treatments can be performed either indoors or out, where the latter is performed in one of the spa’s thatch-roofed privacy hales that create an exotic and organic space for unwinding in nature. Local and natural ingredients play a huge role in the spa’s treatments, including its two signature treatments: the Polynesian Niu Scrub with fresh, local coconut and the Hualālai Island Stone Massage using hot and cold stones strategically placed below and above the body to open the body’s energy centers and promote circulation. 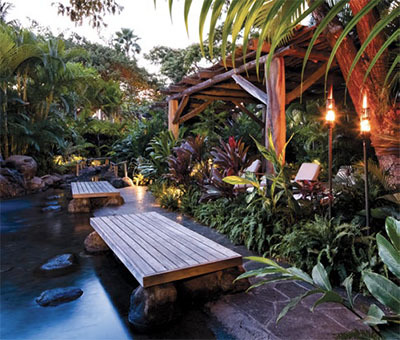 The spa’s extensive menu includes more than 15 massage therapies (including the lomi-lomi massage using traditional Hawai’ian techniques), more than eight body treatments, a handful of water cures (a multistep treatment that includes skin brushing, scalp and foot massages and an herb-infused bath) and a series of more than 15 skin care rituals and facial enhancements. 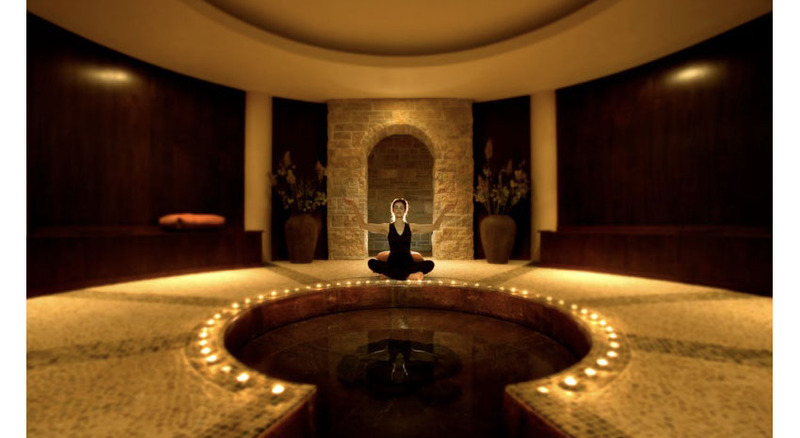 The spa also employs therapists who specialize in acupuncture, yoga therapy and physical therapy to offer customized treatments for guests, along with a full-service salon for hair, nails and makeup application. Indoor and outdoor showers make the experience a seamless encounter with nature where even the products inside the men’s and women’s lounge areas are 100 percent natural, made by L’Oeil du Vert for the hotel’s exclusive Kāwili Project.